If children are a part of your life in any way, at some point they are going to ask you hard questions. I’m talking about the “deep philosophical questions” of life, that you either don’t know the answer to, or don’t know how to explain. And, while the question itself may be hard to analyze and define, the trickiest part is the lack of warning. They hit you out of the blue, and you stand there staring at them with your mouth hanging open looking less than the extremely intelligent person you are. Whether you’ve experienced it or not, I have good news…and bad news. Let’s start with the bad news and get it over with. Unfortunately, I don’t have a cheat sheet entitled “All the Answers to Life and How to Explain Them to Your Children Like a Boss.” If I did, I would share it. But, I feel safe saying there isn’t a one size fits all “how to” guide on this topic. And, although I can’t give you an instruction manual for your kids, I do have some good news. 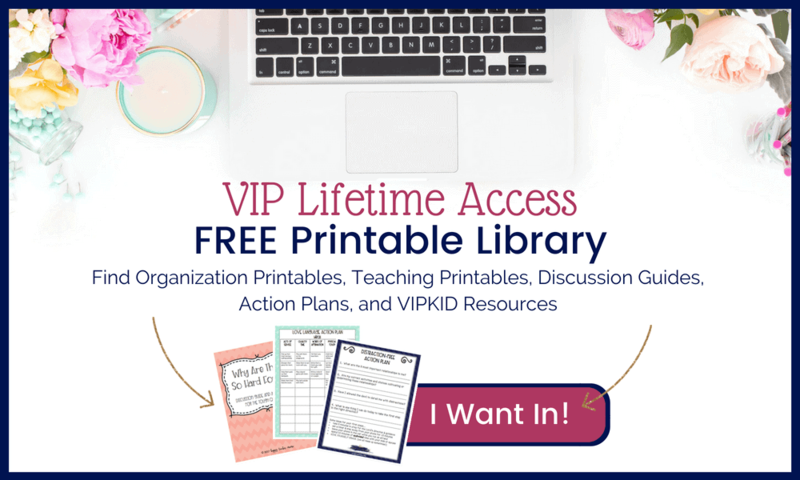 I have created a FREE discussion guide for you! This will help you define what you believe and why you believe it, and it will help you “prep” for the questions your kids will inevitably ask you! But, before you jump ship, I want to help you understand why you’ve been “chosen” for this distinguished honor and where I’ve found the best advice for confronting these questions. 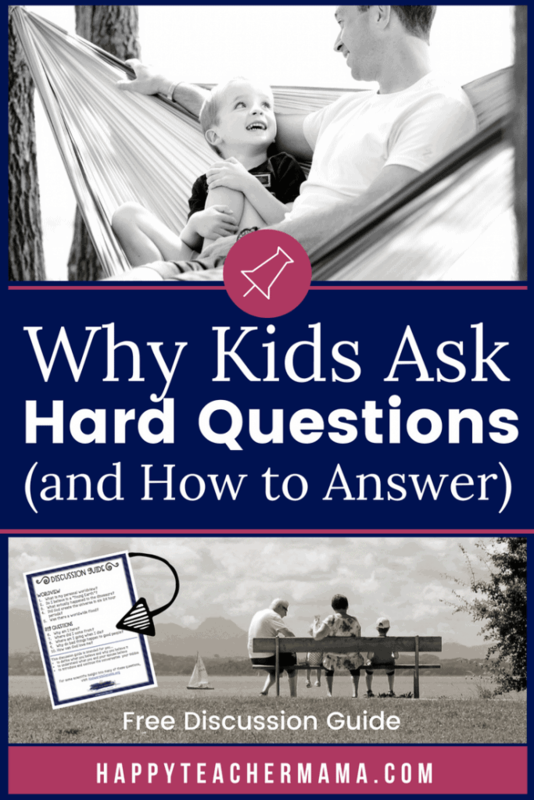 Why Do Kids Ask Us Hard Questions? Well, I can sum it up in three words: understanding, trust, and value. Ok. So, maybe it isn’t quite as simple as that. We obviously need to take a deeper look into what each of these mean. They are trying to make sense of something much bigger than themselves. This is hard for kids, but interestingly, it is difficult for many adults as well. Many of us have never really taken the time to think about why we believe what we believe. Most of us have “just always believed it.” Let me tell you, this is not a good position. You need to understand why your worldview is the way it is in order to help your kiddos make sense their budding worldviews. If you are interested in an amazing website to help you define your personal worldview, I highly recommend Answers in Genesis. (I am not an affiliate with them, and I don’t get any kind of reimbursement for sharing their link. This site has fantastic products for your homeschool, Sunday School, or personal devotions.) I have been using the Answers for Kids Bible Program in our homeschool this year and it is wonderful! This program has allowed my boys and I to tackle many of those hard questions. It has given us the opportunity to open up a great line of communication about why my husband and I believe the way we do. But, most importantly, it explains what the Bible has to say about these issues. Would you allow yourself to be vulnerable enough with someone you didn’t trust to ask that person a deep, philosophical question? No…definitely not. It’s exactly the same with kids. While they tend to carry their emotions much closer to the surface than many of us as adults, they will not ask just anyone these types of questions. So, consider it a privilege if they are asking you because it means they trust you. Most importantly, be honest with them, and tell them if you don’t know the answer to their questions. Kids can spot a phony a mile away, and if you want to develop and grow a relationship of trust, honesty is the key. However, if your kids are never asking you these types of questions, be very aware of who they are trusting with these kinds of questions. Kids are very impressionable, and you want them trusting “trustworthy” people. As a mama, even though your kids may not act like it, they genuinely value your opinion. Between the eye rolls, the huffing, and the puffing, your child actually wants to know what you believe. They certainly wouldn’t waste their time asking if they didn’t. The Bible tells us to “Hear counsel, and receive instruction that thou mayest be wise in thy latter end.” Proverbs 19:20. So, be thankful if your child has approached you. As a teacher, you may be the only adult in a child’s life that she can trust. She may come from a home filled with chaos, hate, strife, and fear, but you are her light. You are the one she wants to please and you are the one she wants to guide her through the myriad of tough questions. Remember to be mindful, sensitive, and gentle in your approach. This will allow you the opportunity, hopefully, to have an ongoing conversation with her. One very important thing to remember is that these inquiring minds are going to also want to know why you believe what you believe. So, take the time now to get that settled in your own mind and heart. This will allow you to be authentic with these impressionable little ones. By this point, you’ve probably figured out what my #1 go to advice book is, but if not, I’ll tell you; it’s the Bible. While everything isn’t always explicitly spelled out, I can find answers to the big questions of life as well as direction for all of the issues I am facing. This allows me to help point my kids to a worldview that is predicated on our Savior. But, what if they aren’t asking me these hard questions? If you are stressing out because you’ve been side stepping these tough questions with your kids, I have good news. You can be the one to start the conversation today! Creating a line of communication now and having an ongoing exchange about these hard questions will build trust and help them learn to value your opinion. So, don’t forget to grab your FREE discussion guide. Remember, it’s never too late to do the right thing. As our children are growing and creating their own individual worldview, we need to make sure we are being open and honest. Because the reality is, if we aren’t, they will find someone who is. I like this post. The whole “they trust you” aspect with hard questions is important eh?